December is upon us, and with the end of 2014 quickly approaching, families from across America are well into the festivities of the holiday season. Today, we’d like to take a moment to talk about a few ways you can keep your family’s smiles shining brightly throughout the merriment of December and on into the New Year. At Complete Dental Care in Burlington, MA, Dr. James P. Kostas and his caring team invite you to enjoy the bounties of this holiday season with these healthy smile tips. Indulge in holiday favorites – in Moderation! This time of year is well-known for its abundance of delicious treats, including everything from decadent dinners and desserts to candy canes and Christmas stocking surprises. We’d never tell you to abstain from your favorite goodies, but it is important to remember that moderation is key. Rather than graze all day on crackers, candy, cakes, and other popular holiday fare, try to stick to your regular three meals a day, always brushing and flossing twice a day as usual. Keep your sugar intake in check. The holidays simply wouldn’t be the same without pies, cakes, strudels, pastries, cookies, and so much more. Unfortunately, these sweet treats are full of the sugars oral bacteria love. The bacteria that live in our mouths convert sugars and starches to acid, and this acid is the cause of tooth decay and other serious oral health problems. Try to drink plenty of water while you eat and throughout the day, and try to avoid foods that are excessively sticky, chewy, or gummy. You can eat great food and still take care of your smile. 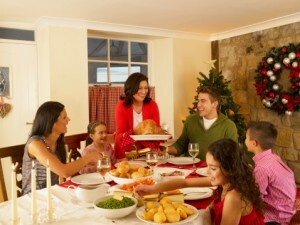 Many of the foods we love to eat around the holidays are actually good for your teeth! Eyeing that assorted cheese platter? Go for it! The enzymes in many cheeses – including aged cheddar, Swiss, Gouda, Monterey Jack, and even processed American cheese – have actually been shown to reduce the acidity of the mouth, leading to a lower instance of dental caries. Milk, yogurt, and kefir are also great choices, as the calcium they contain strengthens tooth enamel. Schedule your routine visit to Complete Dental Care. Though the holiday season is undoubtedly a busy time for everyone, there’s always room for a simple, one-hour visit to our office for an exam and professional cleaning. These biannual preventive care appointments help to keep your smile strong and looking its best all year long, and they present the perfect opportunity to bring up any questions or concerns you might have about your oral health. Celebrate this holiday season in style with a brilliant smile that’s as healthy as it is radiant. Contact us today to schedule your appointment with Dr. Kostas and his friendly, experienced team. We can’t wait to serve you and your family! Our Burlington, MA dental office warmly welcomes patients from throughout the surrounding areas of Bedford, Woburn, Billerica, and beyond.